← >Moral: A stolen stone gathers no moss –but the cops do. >School marm to town marshall: “Who was that masked man anyway”? 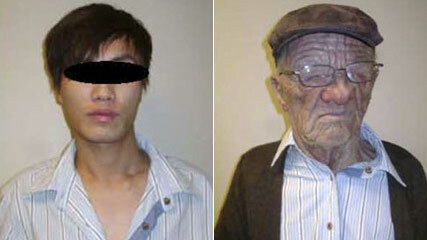 By now you have all heard about the Asian youth who boarded a flight from Hong Kong to Vancouver disguised as a very old Caucasian man. (see above) Using a bogus boarding pass he passed through all security stations without anyone catching on. About two hours into the flight he got up, went to the lavatory, removed the disguise and quietly came back to his seat. A flight attendant alerted the pilot who radioed ahead and the youth was arrested on arrival in Vancouver. He immediately applied for asylum in Canada. The why of this is yet to be revealed. First, if you can morph into someone and not a soul recognizes you, why would you have to go to another country for asylum? Couldn’t you just live there undetected for as long as you like? Secondly, if you’re going to travel incognito, why not pick a disguise the chicks would go for? Thirdly, is airport security just there to inconvenience the innocent travelers? Get a grip folks, this guy had a mask and an incorrect boarding pass. Lastly, I’ve heard that Vancouver has some of the world’s best Chinese restaurants, but are they worth this? A caution for your future airline travels guys. That lovely, vivacious blond sitting next to you…..I’d wait until she has to use the restroom before I’d make any moves. 2 Responses to >School marm to town marshall: “Who was that masked man anyway”? Oops… See I am losing it! My comment about ‘Lot’s Wife was on another blog! !